[Children & Adults (Age: 7 to Adult) **120mm wide and 130mm wide**] Rec Specs Morpheus Street Series Raceway: Looking for strong and sturdy sunglasses for your child? Cool looks coupled with confidence inspiring impact protection (Meets or exceeds ASTM F803), these kids sports sunglasses would be ideal for both general use and outdoor sports (e.g. netball/soccer/tennis/volleyball). Optional prescription lenses made to your actual script are also available. Suitable as a pair of Prescription or Non-Prescription sports sunglasses. Comes with a set of non prescription Polycarbonate Polarized Grey color lenses. Optional prescription lenses available. A detachable strap comes with the frame to help keep those sunglasses on. Comes with matching graphic artwork metal case and cloth as standard. Each frame comes standard with a set of Non-Prescription Grey Polarized polycarbonate lenses. Optional prescription lenses available from US$60.00. 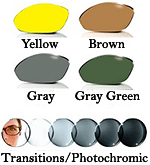 Mirror coatings can be added to tinted/polarized lenses only (not available with Transitions lenses).